Designed by our Creative Director, Lisa, for her own wedding, the Skye collection is a blend of the contemporary and all things minimalist with elegance, luxury and subtle soft feminine touches. 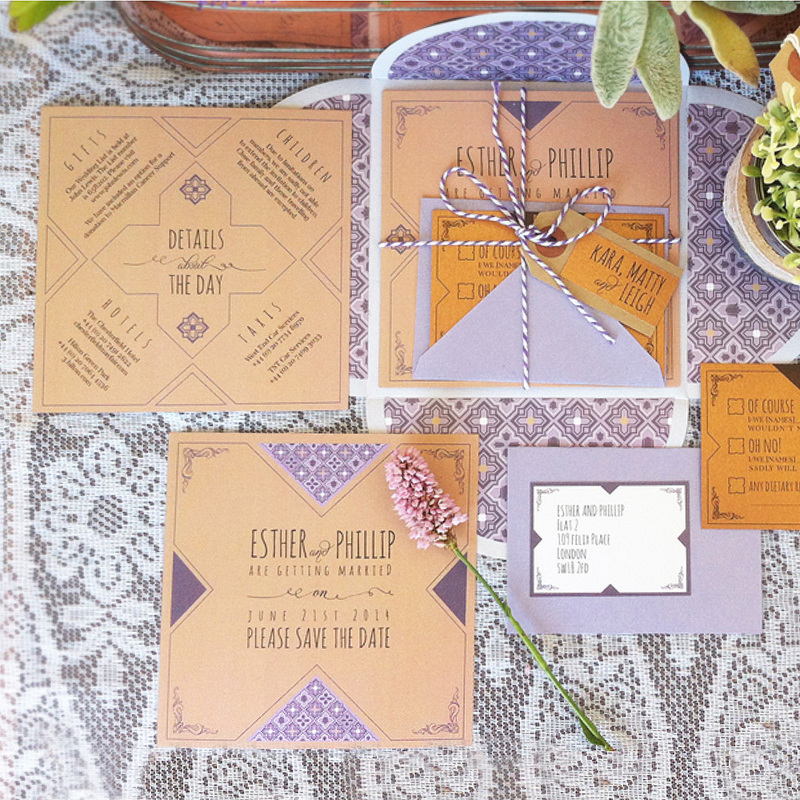 The save the date, with its colour palette of neutral whites and greys, features a graphical monogram with foliage sprigs separate the details to soften the look. 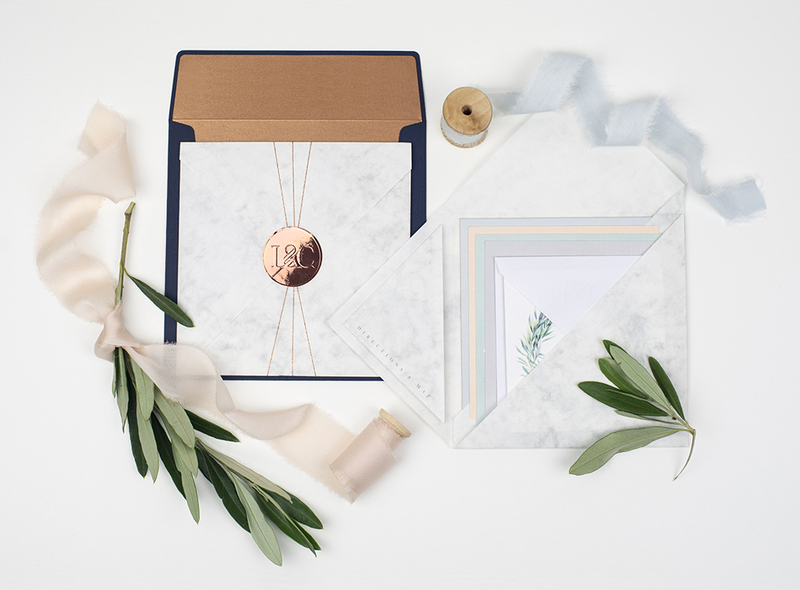 The wedding invitations are cast in a palette of soft grey-blue, pale peachy blush and muted tones, contrasting with rose gold and antique metallic and marble. 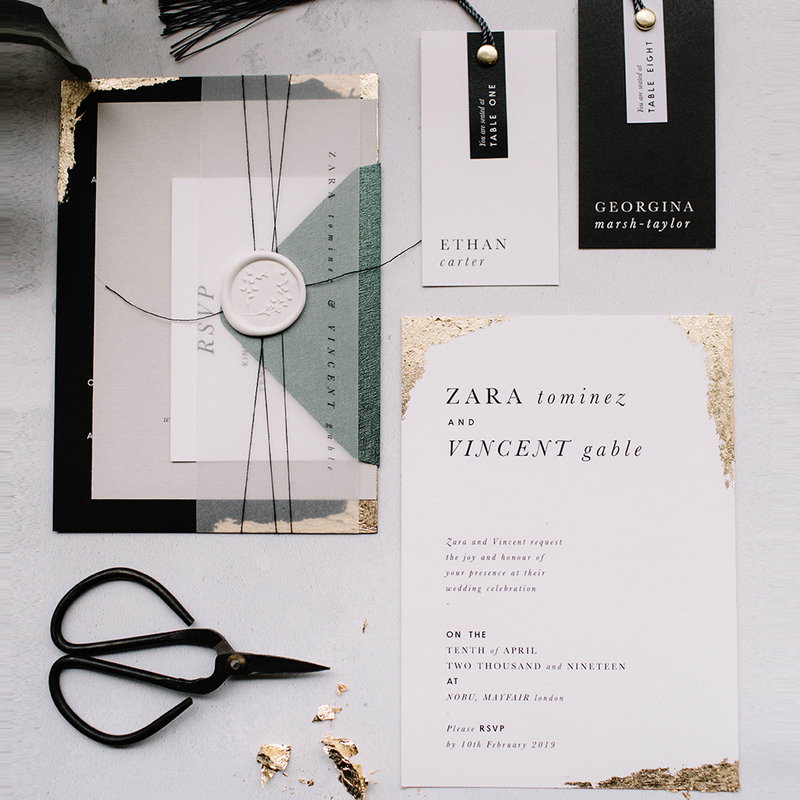 The invitations come with a menu of luxury finishes such as letterpress, fancy papers and gilt-edging, but for those with a more limited budget standard print options are also available. Making a feature of the marbled paper, unique wallet envelopes hold the wedding invite, RSVP card and all the wedding details. Hand made entirely by paper folding, these luxurious wallets even come with a fold-out illustrative map. Once the items are inserted, they are neatly folded shut and sealed with a metallic rose-gold thread and monogram sticker. 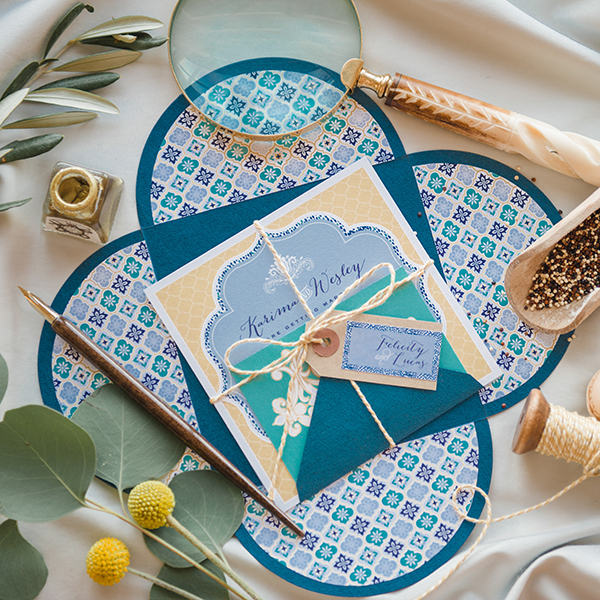 To see this stationery suite in more detail, with tonnes more photos (including how your on-the-day stationery can look) please see the ‘Skye‘ collection in the wedding portfolio pages. 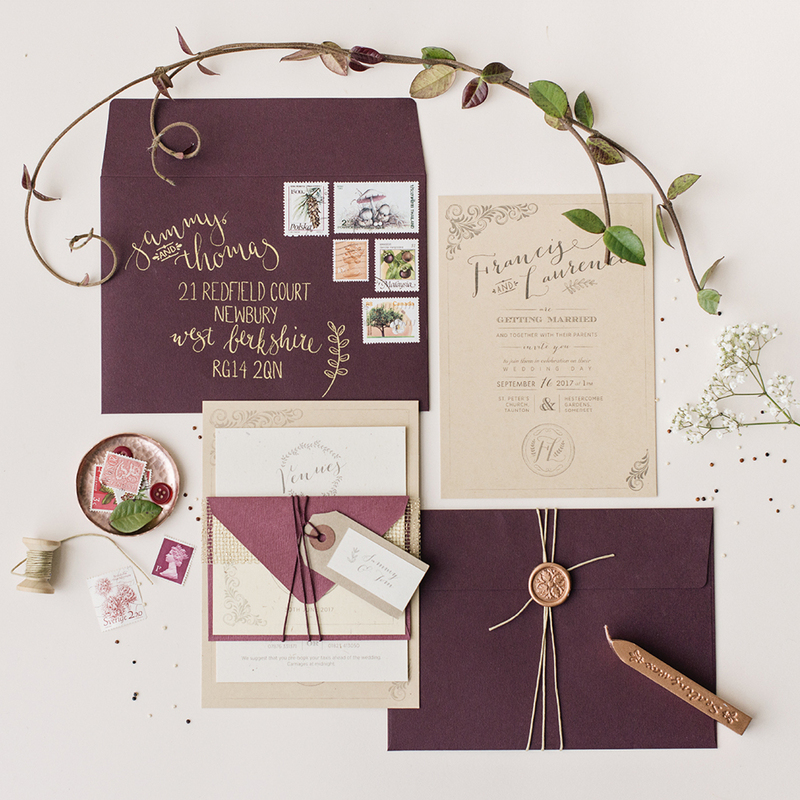 Classic sample packs include: Save the date, wedding invitation printed on 350gsm uncoated cardstock, x2 information inserts, square RSVP with return envelope, 90gsm marble square wallet and fold out map, with rose-gold metallic seal sticker and thread, plus a grey postage envelope and address sticker. Luxe sample packs include: Save the date, 1050gsm wedding invitation with metallic rose-gold gilt edging, x2 information inserts, fold-out RSVP with return envelope, 200gsm marble origami wallet and fold out map, with rose-gold metallic seal sticker and thread, plus a copper lined navy postage envelope and address sticker. 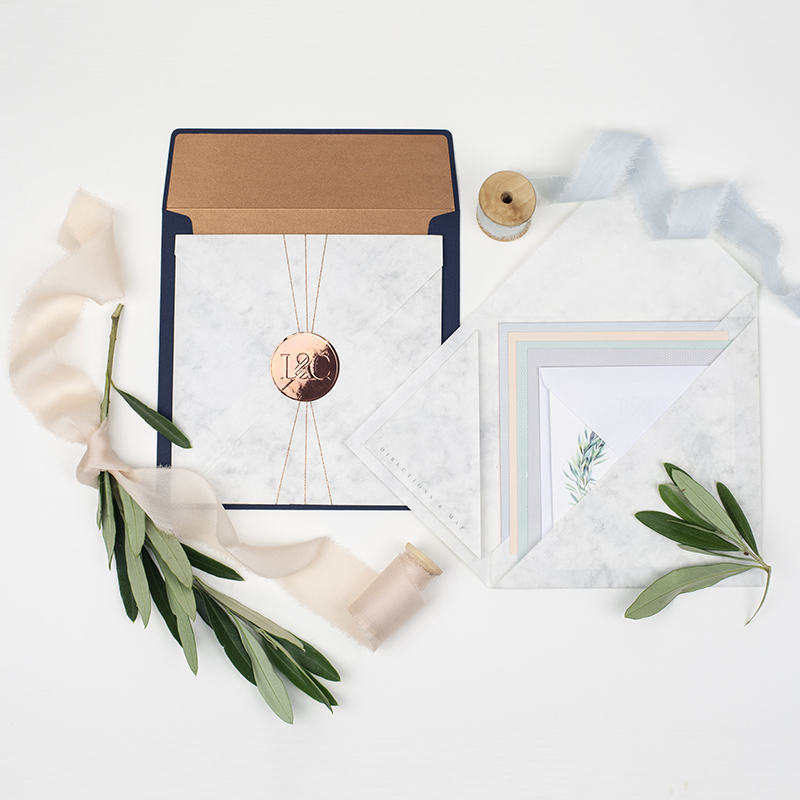 Combination sample packs include: A full luxe sample pack, plus the following loose items from the classic sample; marble square wallet, wedding invitation printed on 350gsm uncoated cardstock, square RSVP, grey postage envelope. This way you have all the possible elements to choose where you want to mix and match items. Sample packs cannot be customised to your own details.